Having a website is an important marketing tool used to share information about your business and to generate sales online. In fact, if your brand doesn’t have a website you could be losing out on great opportunities for your business. According to the eCommerce Foundation, 88% of consumers will research product information on your website and social media pages before they make a purchase online. But with no website to browse you may have just lost out on alot of potential customers. It’s time to make your own website or improve your current website for the better. In this article, I’ll show you the 10 best website builders along with their pros and cons so you decide which one works best for you. If you’re new to creating websites or if you want a website built with just a few clicks, Wix is the best site for that. Wix is a hosted platform, so you don’t have to pay for hosting. 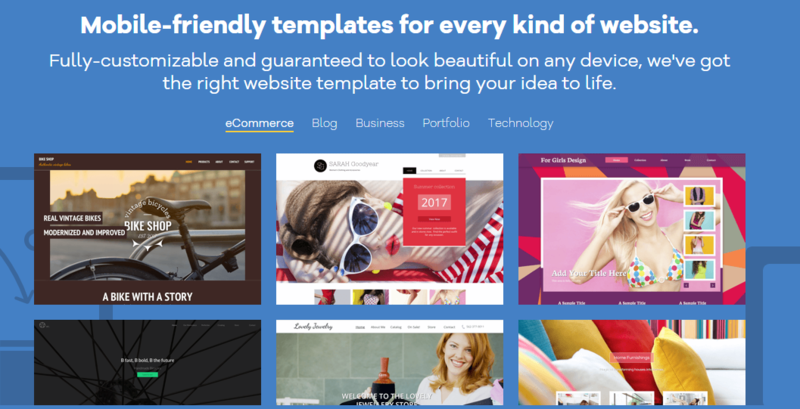 You’ll have the flexibility to build your website using over a hundred free and paid templates with a site builder that comes with an easy-to-use drag and drop editor. Wix also offers a new feature that allows their AI program to create and select a website template, you can also tell the program what industry you’re a part of like fashion or business, the program will ensure to pick something that suits your need or goals. Wix also comes with free and paid app integrations, a few created by Wix, other created by third-party apps like MailChimp or Google Analytics. Apart from templates and basic drag-and-drop options Wix has available, you won’t be able to do a lot of customization to your site unless you’re going to hire a developer or if you're willing to add lots of code to your site. Squarespace is another top website builder I’d recommend to both first time and veteran website builders. Squarespace is a popular, hosted website builder, known for its great designs with sophisticated and it’s easy-to-use templates. It provides first class hosting for your website, so you don’t need to take time out to fix or make updates to your website. You can select, customize and use a variety of website designs that easily allow you to add your information with ease with a point and click feature. You can start typing anywhere on your template so you have more control of your template. You can also use multiple templates for the same website all at once, that’s a perk most website builders don’t offer or allow for users. Your average setup time can range from 30 minutes to 3 hours depending on what you’re using your website for and how much information needs to be added to it. The overall setup is smooth and straightforward without any hiccups. Squarespace is e-commerce friendly site that allows you to add inventory, complete orders, accept payment, discounts and more. You can also integrate e-commerce apps and tools to help transition your buyer’s online experience better. Squarespace also holds it’s placed in the top five website builders with great SEO optimization and page speed. Squarespace offers third-party app and service integration, but it’s limited and can add more work on your side. My advice, fight through it if need be. If you intend to use payment plans, you’re only allowed to use Stripe, Apple Pay, and PayPal, with no option to add additional payment gateways like Visa or Mastercard. There’s no free account so you’ll have to pay to play. You can preview your website, but it won’t be live until you select a paid plan to launch it. HostGator is a well-known global provider as one the best hosting website since 2002, so it comes to no surprise that they went out and made their own website builder called Gator. Gator comes fully hosted by HostGator, of course, so you don't have to worry about managing software, updates or backups, which takes away a lot of headaches when building a website. Good hosting can make or break your site, when the chips are down you can bet on GatorHost to keep your website up and running. Gator provides over 200 website design templates that are also mobile friendly; each is customizable with a drag and drop features for images from a stock image photo library or your own photos, text, columns and contact forms, all with the option to configure. Gator has one of the lowest prices as a website builder; each paid account comes with a free custom website domain name which gives it an edge over other website builders that usually require you to pay. The best thing about Gator hands down as to be that since it's a paid product, your data won't be sold or see any unwanted ads on your website. Gator's blog or e-commerce templates aren't as well designed or functional as other website builders. You may feel a bit stuck with designs and features because you can't hire a developer to add or modify your site. Gator doesn't offer a free account or a free trial so you'll have to pay to if you want to create your website, so if you decide after trying Gator that you don’t want to use it you’ll have to go through a refund process. Shopify has been providing websites for customers since 2006 and has grown since with over 1 million active users and counting. Shopify is one of the most flexible and dare I say easy website builders to use, which is why it’s always listed in the top website builders year after year. Shopify is an all in one website hosting solution with a 360 approach for managing and selling on your e-commerce website with inventory management solutions. Add unlimited products and third-party apps to optimize your store, like Wishpond. If you need a wide range of free and paid store templates, by industry or aesthetic, what you can choose from shopify comes in neck and neck with Squarespace. Shopify, unlike most websites allows you access customized marketing and sales analytics and storage. You can track your orders and inventory in your Shopify dashboard and your sales reports are simplified without all the complex mumbo jumbo terms. Your Shopify store comes with flexible payment options like Shopify Payments, which includes apple pay, stripe, VISA and MasterCard or you can add third-party payment gateways like direct bank deposits. Shopify isn’t only good at e-commerce, they have great SEO features for blogging and online classes. If you don’t like the website design or feel the need to add or change anything you can hire a developer. I might want to add that Shopify has done a great job at providing customer service no matter what paid plan you decide to go choose. The turn around is usually between 2-10 minutes depending on the issue. Shopify prices are a bit higher than other website builders, and they didn’t offer a free plan, but there is a 14-day free trial to try to see if the website works for you. This website builder belongs to one of the biggest website host, 1&1. Like Gator after years of hosting websites, 1&1 created their own website builder. Known by experts website builders, Ionos provides premium website designs that come at an affordable price, and you’ll get an amazing discount on your first payment. Your paid account comes with a domain name and email address, so you don’t have to pay extra or go searching to find a domain or email host somewhere else. They provide industry-specific and mobile-friendly templates so you’ll find something no matter your niche. What separates Ionos from other website builders is its ease in creating a multilingual website with a Ionos Business plan (for just $10/month). No matter what your paid plan your website will have an SSL Certificate and access SEO tutorials so you can optimize even further for search engines like Google, Bing, and Yahoo. Ionos doesn’t allow third-party extensions or apps so you’ll have to move back and forth between your Ionos website and your third-party app. I don’t know about you, but that sounds like a lot of work. The Ionos website builder and online store builder aren’t the same, and you can’t switch one from the other, so you want to start an online store, then you need to sign up for their online store builder, not a website builder. There’s no free trial but feel free to use your money-back guarantee after, but I’ve seen a lot of reviews about Ionos poor customer service. When it comes to e-commerce sites, BigCommerce comes in neck and neck Shopify for the top spot — used by brands like Kodak, Ben & Jerry’s and Skullcandy so you can trust that if you’re looking for a website that grows with you and your business, BigCommerce is the website builder for you. Each BigCommerce website is fully hosted, with up-to-date secure servers and fast page loading speeds. Unlike Shopify, BigCommerce isn’t just for e-commerce, you create a website for events, downloading services, and blogs with drag and drop website templates. If you want to use BigCommerce for e-commerce, you can access multiple sales channels. For instance, you can sell through Facebook, Instagram, Pinterest, eBay, Amazon, and more all from your website. Customize your shipping, flexible tax systems, and drop shipping features to get your business up and running. And great news if you’re a WordPress fan, you can integrate it with BigCommerce for e-commerce flexibility and twice the website speed and security no matter how much traffic you’ve got. BigCommerce provides multiple payment gateways like Stripe, PayPal, Visa Checkout, Chase Pay, Apple Pay, Square, Amazon Pay and unlike other website builders BigCommerce doesn’t charge you a transaction fee no matter what payment method you use. For BigCommerce the interface from the back end, it can be more difficult to use than Shopify and other website builders. So you may have to click around a few times to get the hang of everything. Compared to all the website builders listed here, Strikingly is like the new kid on the block compared to the older companies listed It launched in 2012 since then has helped brands like TribeWanted and OneHelping to host their websites. It's easy to setup and doesn’t require coding if you’re new to website building. Strikingly may be young but it falls in line with providing customizable and mobile-friendly templates. It has one of the easiest website editors compared to Wix and Squarespace. Your site also comes with built-in analytics so you can track the traffic on your website and built-in HTTPS for added security for your website. Unlike most of its website builders, it offers a free 14-day trial and a free account. Strikingly is also known for giving great customer service based on the reviews of new and old customers. Their customer support seems to have a fast turnaround for any problems or questions you throw their way. Strikingly hosts your website for you, but offers the chance to change your hosting or add your domain name for paid accounts. You’ll also get 5 GB of monthly bandwidth so you can don’t have to worry about storage when you start your website. If you’re planning to create an e-commerce store, you must upgrade your account to add products, and depending on how many products you’ll be adding to your store you’ll need to keep upgrading. You need to upgrade to get more than one page for your website or add up to 300 products to your site. However, the pro account is more affordable than other pro accounts from competitors like Squarespace and Shopify. Some people find that Strikingly isn’t very SEO friendly because of the lack of metadata and alt-text features in some areas. Some reviews say adding an SEO plugin sometimes does more harm than good. I’d say try it and see it for yourself. One the easiest website builder around, Weebly is great for website beginners who need to have their site up and running in just a few clicks. It offers designed templates that allow you to customize without the hassle of learning code. Weebly like most, if not all, of the website builder on this list, is a hosted platform, so they manage all your software and upgrades on the back-end, so you don’t have to think twice on your end. You’ll also have access to an app center where you can add the apps you need to optimize your website. Feel free to make your site multilingual, so your international visitors can browse with ease. Unlike other website builders, Weebly offers a free plan you can try with unlimited bandwidth and sub-domain with helpful SEO guides. Weebly is a must have for someone who isn’t as tech savvy and needs to create a DIY website. For website speed and performances, it’s come in last against its competitors. Weebly isn’t as adjustable as Wix or Shopify, or as pleasing as Squarespace. But it’s still easier to use than all three. There’s no restore option, so when you edit your template or website, you’re stuck with the changes unless you go through all the trouble of changing it back yourself. I’ve used WordPress for the past four years and can attest to its many pros and cons. WordPress allows you to create your site with themes or templates free or paid. Wordpress gives you the flexibility to add code in your theme, add over 50,000 (paid and free) plugins to optimize your site. You have full control of your website allowing you to make it into an e-commerce store, membership course, community forums, online portfolio, simple landing page and more. Keep in mind that WordPress.com and WordPress.org are two very different website platforms. The key difference between the two is that with WordPress.org you have to install the WordPress software on a web server. To get WordPress customer support you must have a paid account if you have a free account you have to upgrade or the majority of your support will come from FAQ to guide yourself through the problems. There is a steep learning curve but once you get the hang of everything you’ll be fine. If you’re looking for a website to host your e-commerce store, I wouldn’t recommend Wordpress because you must install and code your payment system in yourself or search for a (paid) plugin that won’t rob you with fees. One the most established and trusted website builders, domain and hosting site. GoDaddy has been hosting and creating websites before you even knew you needed one. It’s improved its website builder over the years with a few added features to keep up with updates and needs of their customers. Before you even build your website, you can buy a custom domain or an email along with your GoDaddy Plan. Which cuts out the hassle of having to buy them or buy them at a far higher cost with other sites like Squarespace and Shopify. Unlike other website builders, GoDaddy gives you step-by-step instructions as you build your website from start to finish even if you’re not a web building pro. The website builder is great if you’re not a tech savvy and need something up and running for your business or blog. You had over 300 template designs and added e-commerce tools like a built-in shopping cart, inventory management, online payment gateways and access to sell from third-party sites like Amazon or Etsy, so you can sell on your store right after you’ve designed it. Website templates also come ready with a mobile, tablets, and desktop versions of each page. You can show off your social media with simple integration right on your user dashboard. You’ll always have access to 24/7 support via phone, chat or email so happens you can get help right away. Your site is SSL certified for security. Your website will have an ad, but only one, in the form of a footnote it can easily be removed at an affordable cost. Email customer support isn’t as reliable as chat or email so keep that in mind if you use GoDaddy. The SEO settings are very basic and can affect your Google rankings if you’re not watching. My recommendation would be to install a third party SEO tool to help. Even though GoDaddy has improved, its website builder the set up is nowhere as fast or sophisticated in design as the rest of the website builders on this list. What about you? What’s your first pick when it comes to the best website builder? Let me know in the comments below and show off your favorite website builder.